Finally, I am flying down to another city within the same time zone! Orange county is one of the important counties of California and Fullerton is a city in Orange County. I had started this trip of mine with a visit to my brother’s place in Windsor, Canada and ended it with another family visit. Fullerton is where my sister and her family lives and my mother has also made it her home now. Was good to be with them and my sister Nandini attended to my dental needs. It was also good to see one of my favourite nephews Arvind who has recently graduated from Columbia University. Dechu Puliyanda (whom we all fondly called Amul) is not just an SVYM member but we have also grown up together in Bangalore. We have known each other for more than 45 years and she is a very popular pediatric nephrologist here in the USA. Our families were neighbours in Vyalikaval, Bangalore and visiting her and her family was very nostalgic and we could catch up on our old times. Finally, the day to leave has arrived. I always intend traveling light but somehow my suitcases find stuff to get filled with. Traveled along with my brother-in-law Murthy who was going to New Delhi on a consulting assignment with the NHAI. The Dubai airport is a busy and a well-built airport, though my only complaint here has been that it has too few public restrooms for the number of travelers it caters to. After a very brief layover, I took the flight home. Always good to be back and Bangalore was so welcoming. The road trip back to Mysore could not have been more pleasant as there were hardly any vehicles along the way and rain kept us company throughout. Looks like I am spending more time in planes this week than on the ground. From Minneapolis I came to Seattle taking an early morning flight. The body is now beginning to complain as lack of sleep, disoriented circadian rhythm and constant travel has begun to take its toll. While I enjoy the lectures and teaching, I must confess that the body is not able to keep up pace with the spirit. Seattle University is a well-known private university in this part of the country. Founded in 1891, it is a Jesuit Catholic University and has a very scenic campus located on the Capitol Hill and around 8000 students are studying here. This university is also known for its religious studies department and I could spend time in an inter-faith dialogue with the Associate Provost, Ms Victoria Jones. She was very keen to know all about Hinduism and Swami Vivekananda. We also discussed on ways to build partnerships. What strikes me as I travel around is the focus and intent of University administrators to enable an environment that gives their students a global perspective and some sort of international engagement and experience. Had a good talk and interaction with senior faculty and administrators of the University regarding Study Abroad and Global Service Learning. Increasingly, American universities are becoming sensitive to the fact that their students need to undertake these engagements in a spirit of partnership rather than take on the role of a provider. SVYM-VIIS has always maintained that both of us give and take in these exchange programs and this view is becoming more accepted nowadays. Americans do realize that one needs to be equivalent and respectful of their partners and we did have a good discussion on how we could do this. We are also appreciated for our organized offering of programs that are both flexible and relevant to the increasing demands of a global world order. As the day nears an end, I can surely look back on a very satisfying and fruitful trip. My fever is starting to show up and these are the times one is thankful that man invented paracetamol (acetaminophen). Need to retire early to catch the early morning flight again tomorrow to Orange County, California. Spent the morning discussing with Shaila about the new course that I am planning called ‘Leadership and Global Citizenry’. I am intending to teach this course to undergrads and a few graduate students at Cornell in the first week of February. We discussed at length our views on culture, multicultural settings and how culture impacts one’s leadership abilities. I am hoping that this course will be something that today’s students who are intending to be global in their perspective, vision and approach will benefit greatly from. There is also interest from other Universities and we need to make this a very enriching and engaging exercise for young people. 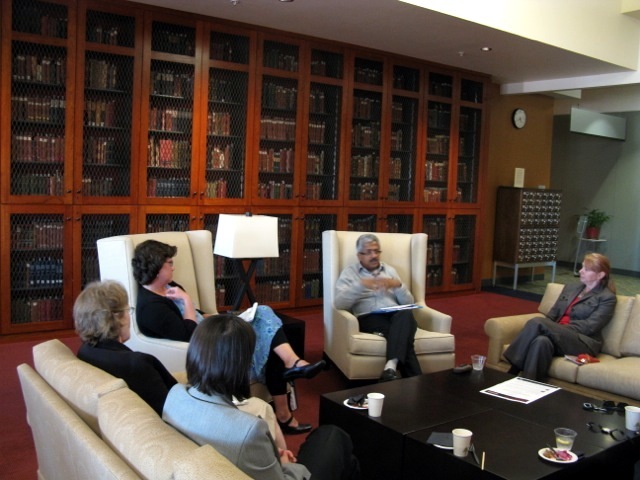 Had a very productive meeting with senior administrators of the University of Minnesota. This University is the Land Grant University of the State of Minnesota and is the second largest in terms of number of students in this country. It has a long list of noble laureates and was made well known in India by its alumnus Norman Borlag, the person who brought high quality wheat to India. My evening public lecture hosted by the Center for Integrative Leadership was well attended by students, faculty, administrators and physicians. Was also happy to meet with Humphrey Fellows from India and medical students who will be interning with SVYM. The temperatures have fallen dramatically by around 20 degrees Fahrenheit. I was unprepared for this as I had expected Iowa city to be much warmer. The breakfast meeting with Fred Smith was a great way to begin the day. Fred is a very learned Sanskrit scholar and can put many of us to shame with his knowledge of India, Sanskrit and our Shastras. The many meetings with the faculty and administrators of the University of Iowa went on well. Iowa City has a group of intellectuals and scholars who have come together and formed the Iowa City Foreign Affairs Council. They had invited me to give a talk on my journey of last 25 years. The talk turned out to be one of the best I have given in recent times and I enjoyed the interaction too. The students conference on ‘Energy and Health for a Sick Planet’ kicked off well. Though it was meant to be a students conference, I was impressed with the depth and seriousness with which it was organized. Scholars from around the world shared their views and perspectives. I found myself terrified at the consequences of a nuclear world after hearing one of the speakers very forcefully present its dangers. It was also wonderful to catch up with old friends like Paul Greenough, Lisa Skemp, Christopher Squier, Anne Wallis and Maureen McCue. Gave three different talks at the Energy and Health conference at the University. These were very well received and I enjoyed the interactions with the students. There was so much learning too. I felt depressed on hearing the issues concerning nuclear energy and coal. We need to quickly find the balance between increasing energy consumption of the world and the environmental damage that producing this electricity is causing. A tough call indeed for developing countries like India with a rising population. Also learnt that there is nothing called ‘clean power’. Any method of producing power is going to have consequences and we can only be sensitive to reducing and mitigating the damages. I could discuss and interact personally with some of the experts in this field over dinner later in the evening. Had a breakfast meeting with Paul Greenough. Paul is not just a good friend of SVYM, but also of India. 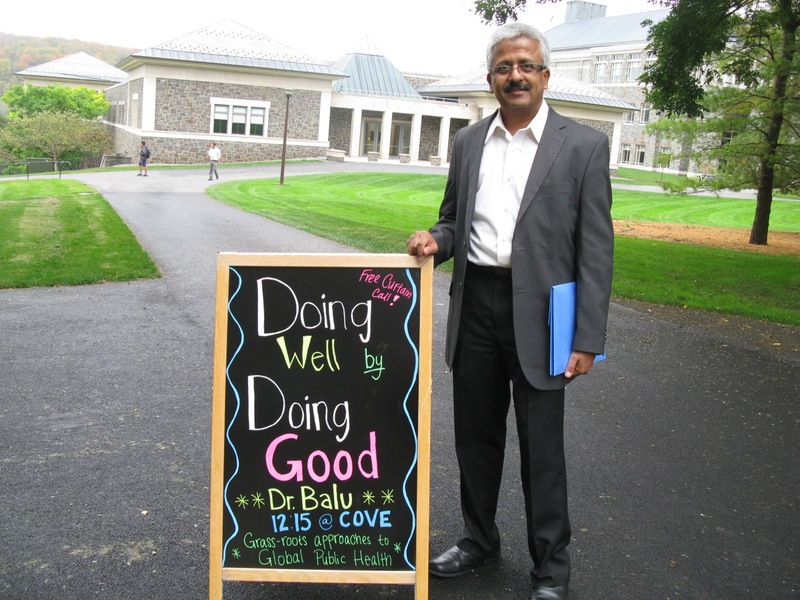 He is one of the principal architects of the Global Health Program at the University of Iowa. He started work in this area more than 25 years ago, even before the rest of the world had begun using the term ‘Global Health’. I have known him for a long time now. We exchanged notes on various issues including politics in India and the challenges that I see for myself and SVYM and the relationship between the University of Iowa and VIIS. Met with Arjun Makhijani who is a well known electrical engineer with expertise in Grid Management and Smart Grids and is an enthusiastic nuclear energy opponent. He has authored many books on this subject. Have invited him over to share his knowledge and expertise with GRAAM and with the Government of Karnataka. 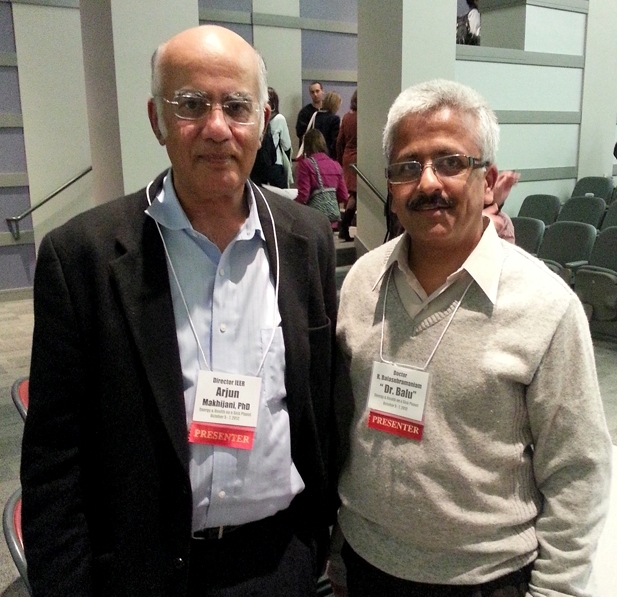 The highlight of my visit this time to Iowa City was meeting with VC Patel. VC, as he is known, is a well-known Hydrologist and Environmental engineer and was the Director of the Institute of Hydrology here at the University. He has now retired from all active water-related work and is full time into the Swaminarayan Movement. He sees his life’s mission as service to this cause and to humanity. I had a good Gujarati lunch at his place and we spoke on so many issues – on his Guru, the Swaminarayan Movement, the resurgence of Hindu Thought and Leadership, etc. Most importantly, in a simple and yet profound way, VC told me what his Guru had instructed him when he took over the Directorship of the Institute: ensure that you take care of your team members, work for them and your Organization and never for yourself and be ready to lay down office and move on at a short notice. Somehow, I saw a lot of messages for me too in this brief conversation. Minneapolis was also cold when I landed and Shailendra was there to receive me. I enjoy my conversations with Shaila as they are very stimulating and enriching. Our relationship goes a long way and ever since I met him for the first time as a medical student, I have found him a very intelligent person. He loves to teach and share his experiences with his medical students now at the University of Minnesota. He always has a good book to recommend and gift me whenever I see him. He and his family are also such lovely hosts and I have always enjoyed staying with them, however short the visit is. Had another informal discussion with Eliza Kent who invited me to give a lecture in her class next spring on comparing the Anna Movement with Gandhian Satyagrahas. Have promised to do so if I do come here in the spring semester. The anti-corruption movement seems to have captured people’s imagination here too. They have already begun to study and research on why it failed. I for one, believe that the leadership was lacking and people no longer kept ‘fighting corruption’ as the work at the center. Suddenly it was also about being in the limelight and getting all the credit for the work, etc. Met with a student who would like to take the Global Health course that we are planning to offer in VIIS next July. She is very keen on understanding public health, globalization and is a serious pre-med student. Spoke to her over lunch and was impressed with the seriousness with which she was mapping out her life and career. She is keen on not just acquiring International experience, but on exploring on how best she could engage and contribute to the development of humanity at large. Traveling to Iowa City has always been an adventure for me. I have been coming here each year for the last 4 years now. Airlines have given me scares each of these times. If it was getting off-loaded the first time (because the aircraft was small and they had to reduce some weight) or my baggage and I arriving separately and having the second segment of my journey out of Cedar Rapids airport cancelled the next time, or Delta Airlines giving me a scare this time by nearly cancelling the flight from Syracuse into Cedar Rapids – I seem to have seen it all! Maybe the small airport with limited connectivity is the problem, though the ticket price could have nearly gotten me back to India itself. But I am thankful that I did get in with my baggage all in one piece. I settled down late into the Iowa House, which is a hotel run by the University on its campus itself. My body now needs to get used to having lost one hour in the day. Drove down to Cornell and then onto Colgate university along with Joe. We drove through the village roads and I was fascinated to see how rural New York was organized and how governance operated here. Infrastructure is a given and hence the pressure of migration is lesser. Colgate is another beautiful campus, located on a hill and is full of stone buildings. 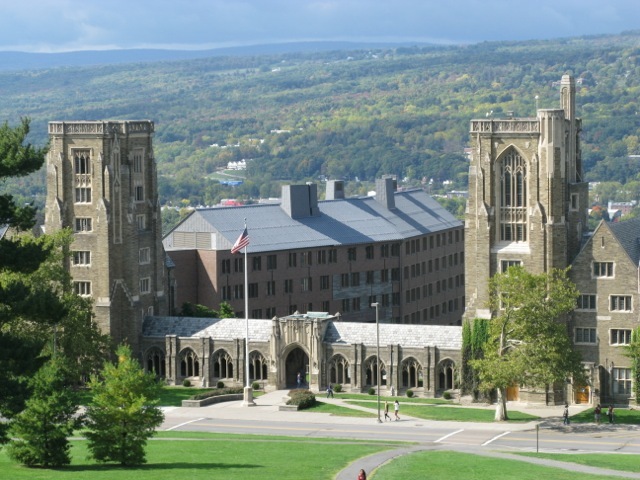 The difference between Colgate and Cornell is that this University has taken a conscious decision to retain the architectural beauty of the place. All the buildings have character and a personality of their own. Some of the older buildings (more than 100 years old) have been built by hand by priests who lived at the seminary here. They had to manually cut stones from a local quarry and build them on their own. Each place has a story of its own and it is indeed heartwarming to know them. I had a brown bag lunch here at the COVE center, which offers students the unique opportunity of providing service and volunteer opportunities all over the world. A large number of them attended and it was a very lively and engaging group. Walking around the campus was also fun and a good opportunity to interact with Prof Eliza Kent who teaches Hinduism here. It was good to share and discuss many things common to both of us. The more I meet and engage with undergrad students here, the more I am impressed with their abilities and their intent to make a difference in the world. I am also fascinated with how young Indian students who come here are able to flower out so well. I wonder if they could have done this well if they had stayed back in India in an undergraduate program there. I met with Srikar Gullipalli who has researched the issue of corruption in public services in Bangalore and was very impressed with his work and understanding of the issue. He has been able to present this work to various people around the world including the British Prime Minister and I wonder if he would be able to do all this if he had studied in a college in Bangalore. He is keen on coming back to India with enough knowledge and competence and work to make a difference there, especially in Governance and Public Service issues. The evening talk was also very well attended and received by the students and faculty. The dinner meeting with the faculty and a couple of students coming to India was also very encouraging. It is good to see India as a destination for these young students for learning and sharing. 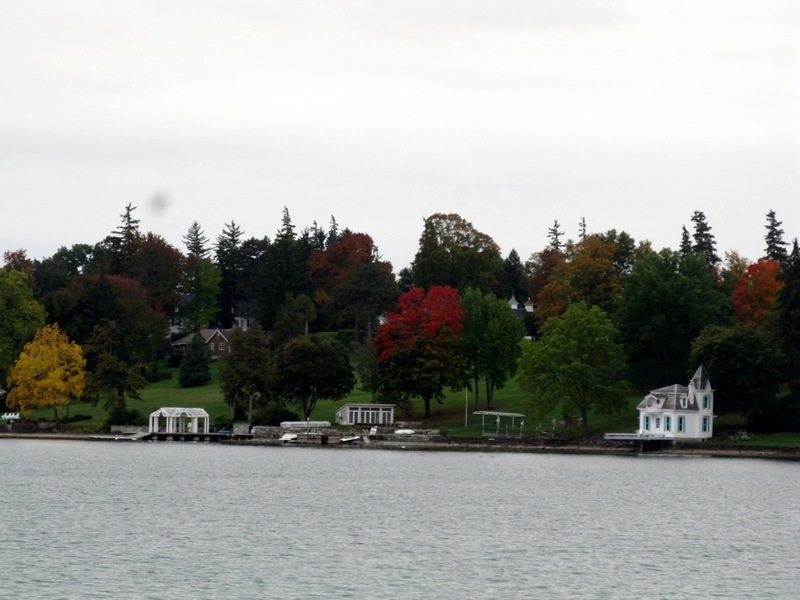 The drive to Syracuse from Skaneateles was again very scenic with the leaves changing colours gradually. Shades of red, yellow and orange along with the green made it a visual treat. The Maxwell School of Public Policy is another leading public policy school in the world and it was good to engage with the faculty and students there. The school is part of Syracuse University and has a long association with India. They have a working partnership with IIM-Bangalore, apart from training most of the Civil Service officers from the late fifties onwards. This school has photos of Jawaharlal Nehru visiting them. 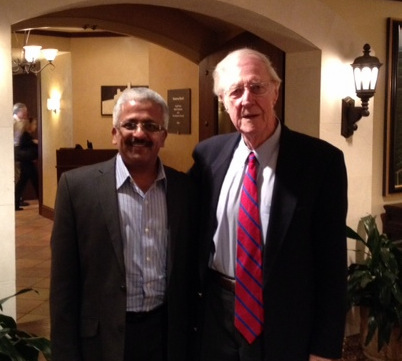 I met with a senior professor Larry Schroeder who has fond memories of training many Indian bureaucrats. The evening provided time for a quiet dinner and some catch-up conversation with Joe in a small but warm restaurant on the banks of the Skaneateles lake. Spent a quiet day at Skaneateles catching up with all my writing and planning for the rest of the week. Needed the time to prepare for my talks at Colgate University and University of Iowa later this week. Spent some time walking along the bank of the lake, thinking through the many things that still needs to be done. Walked thru this small town (which is called a village by the local people) and was happy to see all the small family-owned stores. The town has passed a resolution not to allow any large franchisee or any of the large retail stores or malls here. They have resolved to let the locals sustain their own economy. And to think that our Government is welcoming the large retailers to India! I have always been fascinated by the capacity to cope of young Indians who have been born and brought up in the US. Many of them are able to straddle between two worlds, two cultures and two different ways of seeing the world. Most of them have done well and are generally considered as high performers in the universities. Strangely, many still harbor the same kind of desires and aspirations – a good higher education either in medicine, engineering or law, and a reasonably good financial base. Many of them are able to be American yet Indian in so many ways. Over breakfast, I met a couple of young girls who were doing their undergrad studies and were pre-med students. The more I interact with these students, the more I am convinced that many of them want to engage globally – learn the skills that could make them walk many worlds and cultures and to give as much as take from the world that they know of. These views of mine were further reinforced by Jihea Khil, a young South Korean undergrad who is passionately committed to engaging with students groups around the world and helping poor students in getting a good education. She and her friends believe that education is a good way of bringing the youth together and would like to use the power of micro-finance to help fund these students to pursue their education. I then drove from Ithaca to Skaneateles along with Joe and moved into the Sherwood Inn. This is a 205-year-old hotel and is very old, very warm and has the old world charm around it. This is going to be my home for the next 3 days and it sits on the banks of the Skaneateles Lake. This lake is one of the purest lakes in the US and supplies drinking water to the cities of Skaneateles and Syracuse. The local community is very engaged in keeping it clean and the water supplied is not even treated. That is the level of confidence of people in their engagement and they just will not allow any form of contamination to happen anywhere nearby. So many lessons to learn on community engagement and control of local natural resources from these people! How I wish that we could replicate some of these experiments back home in Mysore and H.D.Kote! Had a quiet evening dinner with Joe and his family – his wife Mari and two lovely children, Dom and Mia. Everything but the weather is looking up and I have to gear myself up for another long and engaging week ahead. This week will see me lecture at 3 different universities and a lot of travel is in store ahead. After a week of hectic meetings and lectures, I finally found some time for myself. It has been 4 years since I’ve been coming to this beautiful campus at Ithaca, but have hardly explored it or the surroundings. Ithaca is one of the most beautiful places, especially in the fall. The Cornell University is possibly one of the most scenic of the many large American universities and houses very large and Gothic buildings. The newer structures, in my opinion, do jut out like an eyesore amidst the castle-like buildings that one sees laid out thoughtfully over the hills. I also visited the Johnson Museum of Art, which serves as an educational resource for Cornell and is one of the most important university museums in this country. Donna Ramil, another thoughtful and efficient organizer who runs the GSL program at the ILR school, drove me around the campus and showed me the plantations, the orchards and the different schools located here. We also drove with her family to the Taughannock Falls and I was surprised to see a young couple getting married in front of the falls. These Americans can indeed think of some out of the world ways in which to get married! The entire finger lake region is what the melting glaciers have left behind and nature is indeed very partial to the area. What is appreciable is the fact that these areas have been preserved well and yet tourists and the local people are allowed to freely visit and enjoy its pristine beauty. The icing on the cake of my visit this week was meeting the Basus again for tea. Both Kaushik Basu and his wife Alka Basu are such wonderful hosts and they found time amidst their busy schedule to listen to all the work that we have been doing. He is indeed someone who is not only simple and humble, but also very open and willing to be challenged and keen on learning other perspectives. He has promised to visit us sometime and hopefully that will happen soon. Staying at the Alice Cook House was primarily meant to be an opportunity to interact and engage the undergrads. I was impressed with the energy and vibrancy of the youth, as it is in all countries. How wonderful will it be if they can all come together, network and learn to lead humanity to a better place! What struck me was the diversity and the cultural heterogeneity of the student population. Students come from all over the world to this and other Ivy League universities and integrate so well and learn so much from each other. This is possibly one of the ways in which one can learn to better appreciate and tolerate divergent views, cultures, religion and other differences that the human mind can think of. Teaching faculty in the US is obliged to hold ‘Office hours’ for students. What it means is that they are available consistently at designated hours for student interactions on a one-to-one basis. This provides the students with opportunities to clarify their doubts, receive counseling support and also build relationship with the professors. The professors are also able to judge and assess the students better by these interactions. My engagement with the undergrads this year was complete with my holding office hours and meeting with students with diverse interests and from different countries. I had students from India, China, Bangladesh, Japan and USA meeting and interacting with me on different development and leadership issues. American universities are now a potpourri of culture and students from different countries, backgrounds and cultures provide each other a rich learning experience. Malcolm Gladwell writes about ‘Connectors’ in one of his books ‘The Tipping Point’. I was deeply impressed with meeting one such vibrant and warm person. Apart from just about knowing everyone, Lesley Yorke was keen on using these connections for the good of others. She was driven passionately by the desire to do good and saw her abilities to build and network with the people she knew as a channel to do good to the world at large. Cornell has its share of many such special people and I deem it a privilege to meet and interact with them. This visit also provided me with the opportunity to meet another wonderful and well-read person. Koushik Basu was till recently the Chief Economic Advisor to the Prime Minister of India and has now been appointed as the Chief Economist of the World Bank. Apart from giving me time on this last day of his work at Cornell before joining the World Bank, he patiently and engagingly listened to what I had to say of the micro-economic and development contexts of Indigenous communities. Generosity and courtesy shown by people in this foreign country is indeed something that one can cherish. Whether it was the warm welcome that Miguelina showed me on the day I arrived or all the help that Laura Haley in Joe’s office gave me – each one has been helpful and supportive in their own way. Susanne, despite being such an acclaimed and busy researcher, found the time to drive me around and show me one of the gorges that Ithaca is so famous for. The day was still not over for me as I had a dinner meeting with Saurabh Mehta and his wife. Both of them were recently married and we met at the well-known vegetarian restaurant Moosewood, which is owned by its employees on a cooperative basis. Public Policy and Public Affairs is an area in which I have developed deep interest over the last many years. It is this interest that shaped my focus in Harvard and led to the founding of GRAAM. The day began with discussions with the key people at the Cornell Institute of Public Affairs over how we could collaborate and shape the partnership in the coming years. The raging discussion in India about the challenges that we are all facing in the area of Child Nutrition is now both a matter of concern and shame. It is indeed sad that more than 50% of our children less than 5 years are malnourished. We need to find answers and find them quick. I have been talking to nutrition experts, academicians and policy planners on this and seeing how we could bring together all this knowledge and wisdom in tackling this problem. One of the respected names in this area is Prof Rebecca Stoltzfus. She is also a fellow at GRAAM and is deeply committed to addressing the issue of malnutrition. Interacting with her has always been a pleasure and she is a very warm person keen on understanding issues with an open mind. Working Hard, Working Poor is a good book written by the well-known Labour Economist, Prof Gary Fields. I try and visit him whenever I come to Cornell and this visit was no exception. I was happy to receive a signed copy of the book from him. The day wore on with more meetings and I interacted with the students of the Global Service Learning (GSL) program who had been to VIIS over the last 2 years. Most of them carry such fond memories and are keen on visiting India again. The GSL program is indeed working well and I see it as a great platform to get people to not only know and understand India but also begin their own personal journey of Global Citizenship. The day began with an excellent interactive class that I led on Leadership for students at the ILR school. The more I interact with young people, the more I am convinced that Leadership could be a great means to get the young of the world to look at Global Citizenship. So much can be done by well-meaning, value-based leaders who have the adventurous spirit of youth on their side. Community engagement and development are such interlinked processes and one needs to keep looking for different ways to do this. There are so many ways of achieving this and I tried to understand from Ken Schlather, the head of Cornell Cooperative Extension on how this operates in their culture and context. The US has the concept of Land Grant Universities and this binds them to ensure that the knowledge and research that is built up in the academic world of universities is actually made available through outreach and extension activities for the public whom they serve. I have always found teaching undergraduates and graduates different. The transaction methods, the level of engagement and the interaction differ based on the experience and diversity of the students in the classroom. The Frank Rhodes Professorship necessitates that I make my experience and knowledge available for undergraduates, and I had a good time interacting with many of them in the evening dinner. This dinner was organized at the Alice Cook House and students could use the opportunity to dine and discuss with me. This was followed by another interactive session with many of them. Such engagements give the students opportunities to expand their learning beyond the structured courses that they take to graduate. Feeling refreshed after a good night’s sleep is such a welcome thing! After eating all the rich meals at the lunch and dinner meetings that I have been having, I longed for something very simple and made myself an ordinary breakfast. The day started with meeting a very different kind of student. He was Daniel Green, a senior student in the Applied Nutrition and Psychology course. He wanted to share some of his ideas with me and I was impressed with his passion for changing the world in his own way. He was keen on spreading the message of not losing weight but on how not to gain weight at all. I found a lot of parallels between my own ideas of Leadership & Global Citizenship by engaging the youth and his ideas of working with young people in ensuring that they never put on unnecessary weight in their lives. Found his lateral thinking very different and it was indeed a great way to begin the day. A large university has its own complex way of working. Superficially this feels disjointed but there is always a quiet unseen hand connecting all the dots. I had to now meet the people managing the Rhodes Professorship and that was what was next on my agenda. Being a full professor also brings in many entitlements and the prized one for me is the library and e-access that it gives. Learning and staying well-informed of topics that interest me has always been something that I have cherished and that is why I stay attracted to the academic environment of Cornell and Harvard. Another lunch meeting meant more food while at the same time helping conclude some useful business for VIIS. These lunch and dinner meetings usually serve the purpose of both socializing and accomplishing something useful. Americans have indeed mastered this and it does help save time and enhance efficiency. So much actually gets done but then my growing midriff is a cause for concern and will possibly become an object of ridicule if I don’t do something about it soon. Had a good lecture for students of Global Health. Increasingly, I find myself deriving tremendous fulfillment from my teaching and lecturing. Organization behavior and organization development is something that I have been trying to understand for the last many years. Each organization has its own culture and usually begins with the values that the founder espouses. Sustaining values beyond the initial days and making them into an organization culture is a fascinating process. My quest to know more has led me to many interesting discussions with experts in this field. One such person is Marya Besharov who teaches here at Cornell and is also an alumnus of Harvard. Spent time with her discussing some of the issues that SVYM is currently facing and brainstormed on how one could possible deal with them. Sustainability is a growing science and mankind has no choice but to explore different ways to make life on this planet sustainable. The Atkinson Center for a Sustainable Future is a new experiment that Cornell is trying. Apart from taking on the daunting task of studying and spreading issues of sustainability, it is trying to bring together academicians from different disciplines in Cornell to work with practitioners and jointly explore solutions. This is so much similar to what GRAAM aspires to do. The only difference is that we are small, struggling and constantly trying to survive and sustain our energies, while this Center at Cornell is well endowed and has a rich talent pool of experts. What is common is the founding philosophy and the passion and commitment of team members in both the places. Meeting with the Director of the Center and discussing some of the ideas of GRAAM meant opening up new ways of approaching the problem. So many people are doing such wonderful work in their own ways. The need of the hour is to network, synergize and see how one can collaboratively find solutions. Possibly this is where the secret of sustainability itself lies. Visit to Cornell is special for many reasons. Apart from the many meetings, lectures and classes that I teach, it is interacting and sharing views with diverse people that make it worth the while. More than anything, I cherish the friendship of a wonderful person here at Cornell. He is Joseph Grasso, the Associate Dean at the ILR School. ‘Joe’ is the one who has made so many things for SVYM, VIIS, GRAAM and me possible. Every visit of mine usually begins with a breakfast meeting with him at Taverna Banfi – the restaurant attached to the Statler Hotel and School of Hospitality. After going through the program for the week ahead, we also discussed other business matters. I also spent the early hour sitting in his class where a guest speaker spoke about the crisis in the health care industry in the US. The Frank H.T. Rhodes Professorship is in honour of an extraordinary individual who was the President of Cornell University. A lunch meeting was arranged with him and it was such a pleasure and privilege interacting with him. Great men are also so simple and humble – possibly that is what confers greatness on them too. Rhodes was no exception. Being an accomplished geologist, academician and a Former President of an Ivy League University did not really mean much to him. Even at nearly 90 years of age, his thoughts were so clear and I found a wonderful listener in him as I shared my views of Global Citizenship and Leadership. I felt elated to be conferred this professorship named after such an eminent person. The day wore on with the body still trying to cope with the jet lag and lack of sleep. Thanks to the liberal dose of caffeine, I could stay focused on meeting another energetic person who is the Dean of the Law School here at Cornell. The evening talk was a real battle of my mind with my body. The lack of sleep was showing with the mind demanding that I focus, while the body crying for sleep and rest. Hopefully I will get the much needed sleep tonight. Being with family for a few days was invigorating. Having spent the last two days with my mother and my brother’s family was very welcome. I did miss my nephew Arjun though. My sister-in-law Vidya is now coping with her ‘little’ son having gone to University in a distant city. Arjun has just joined the prestigious McGill University for his undergraduate education. The house does feel empty without him. One especially misses him when one needs his inputs for any gizmos that one uses. Arjun is such a wonderful boy and I am sure he will go places. Funny how the cycle called life keeps repeating! It looks like it was only yesterday that I left home as a young 17 year old to do my medical course at Mysore. I was so excited about the prospect of a life away from home that I did not pause to think of how my parents would feel. Only after seeing how my brother and sister-in-law are coping with this change can I truly understand what parents go through. Left Windsor and my brother drove me through the border crossing back into the USA. The flight from Detroit to Newark was quick and on time. A minor confusion meant that Arun and I were looking for each other before we finally met up at the airport. As always, it was a pleasure to meet him and his wife Radhika. This visit to Robertsville near Princeton where they live was primarily meant for them. A good South Indian lunch was the icing on the cake for me. Both of them are a couple made for each other and are soon to be parents. The joy and anxiety on their faces was evident. En-route to Ithaca, we visited Mr.Guru Bale (my wife Bindu’s uncle) at Edison. Mr.Bale and his family are one of the finest that I have interacted with in the US. Apart from being major donors of SVYM, they are also extremely helpful, considerate and warm people. Meeting him is always a pleasure and it was well worth the small detour that we had taken. The next 5-hour drive to Ithaca was memorable. The fall colours was just beginning and nature indeed is partial to this part of the country. We reached around 9 pm and I finally settled down at the very tastefully furnished suite at the Alice Cook House on the West Campus of Cornell University. Ms.Miguelina, the very efficient person that she is, met us at the entrance and helped me settle down. So many helpful people and so many of them to ensure that I am very well taken care of! One feels very lucky indeed to know such wonderful people. Being a columnist is possibly one of the most challenging things I have ever done. I have always penned down my thoughts not because I have wanted people to read them, but have seen it as a channel to express my views, ideas and frustrations. I enjoy writing and it has helped me preserve my sanity. Most of my writing happens only when I am inspired to write. Matching inspiration with the pressures of meeting deadlines is indeed challenging, and this may be the reason why I am yet to finish my book on Leadership. This being said, I have also loved to hear feedback – especially positive ones – about my writing from my readers. The day began with me penning down my thoughts on Higher Education. There was so much to share and I had to be careful in not letting everything down in one article; otherwise it would make it too long for any reader, including me. We then went to visit Detroit and spend some time there and also do some shopping. In my earlier visits I used to be overwhelmed by the malls in the US, but they no longer fascinate me. I never really do much shopping, but I used to be impressed with the crowds and the behaviour of all the people who come there. Malls are good places for people-watching and you can see people from all ages and socio-economic backgrounds come there and spend the whole day shopping, talking, eating and looking very busy. I am sure much of American economy is driven by these actions. I could see hundreds of people milling around the shops, carrying huge shopping bags, driving around in their latest cars and all-in-all, spending their money happily. My mind went back to the experience on the river front in Windsor yesterday, and could immediately see the difference. The recovery of the car industry of Detroit is for all to see. May be the US economy is indeed improving…good news for Obama and his campaign! Jet lag seems to be directly related to one’s age and I feel it more as the years pass by. Comfortable travel does not seem to be directly correlated with how one feels after traveling backwards in the calendar. I am slowly recovering from it, though I must say that I could not avoid falling asleep late in the afternoon and paid the price for it later that night. Today was my father’s third death anniversary and as is the custom in many Indian families, we had a ceremony to mark the occasion. All of us kept remembering my father and the extraordinary life that he had led. He was a self-made man, and more importantly he had made sure that his poor upbringing did not in any way prevent him for supporting all his children in getting top class education. He must be really proud to know that each one of us is leading the value-based life that he wanted us to lead. We miss him so much and not a day passes when we don’t remember him. My brother had organized the pooja and other rituals and I was impressed to see the way in which the two priests who had come from across the border in the US perform the same. They were definitely more involved and diligent than the ones I have seen in India. There was no mobile phone that rang to break the ceremony and their involvement was total and complete. Even a reluctant participant like me found it engaging. I could sense the pain and sadness in my mother who misses him constantly. I can understand how difficult life must be for her to live without somebody with whom she had spent more than 50 years of her life. Later it the evening, my brother and I walked along the Detroit river and I was taken aback by not seeing anybody there on a Friday evening. This, as I remembered, was a vibrant fun-filled place teeming with people and tourists. The waterfront parking lot and the roadside casinos would be full of people having their evening fun and dinner. For the first time in recent years, I found the downtown area completely lonely. The recession is now clearly visible and I learnt that the unemployment rate in this automotive city of Windsor is around 12%, higher than the country’s average. No wonder that people are not eating out on a Friday evening (as is the wont of most North Americans). I hope things will get better in the coming days. Though I have been visiting the USA since 1991, I have never really tired of what the country has to offer. Though the day-long air travel does sound tiring, boring and strenuous, I have always inspired myself with the possibility of so much learning and sharing that I indulge in when I visit this country. This being said, I did feel a certain sadness in leaving my family behind. Three weeks can be a long time, especially when your loved ones are so far away. Having an early morning flight out of Bangalore meant that I could leave Mysore at around 10 pm on the previous day. Three of our teachers at VTCL – Kumar, Triveni and Mahesh – were also traveling to the US on a Teacher Exchange Program on the same day and accompanied me. It would be their first travel by an airplane and all of them were pretty excited. I was pleasantly surprised to see them travel so light! At the Bangalore airport, I took them around and explained all that they needed to do – from check-in to immigration to security clearance. My explanation may have been reassuring for them, but I felt it may have taken away the thrill and charm of learning all this on their own. I still remember my first international travel and all the fun and anxiety that I went through. They were traveling by a different airline and I could meet them once at the gate just before I boarded my flight. The long flight was made tolerable by the excellent service on board the Emirates flight to New York via Dubai. I have always used these long flights to catch up on the latest movies and this time was no different. Apart from catching up on sleep, I also managed to read a good book: ‘The Fifth Discipline’ by Peter Senge. Ever since I had heard him speak, I have been planning to read his work and the first few pages have not disappointed me. The only hitch till now has been the inactivated mobile number of mine and hopefully it will soon be set right. The JFK airport at New York has a life of its own. It has a strange mixture of both the old and new. I am fascinated by all the construction that seems to be happening endlessly. There is always some portion that is being improved and one is indeed impressed with the number of flights that land and take off each day. Millions of passengers from both within the US and outside pass through the gates located in 8 terminals of this airport. More than 100 airlines from 50 countries fly into JFK. From New York, I proceeded to Detroit. My brother picked me up at Detroit and we drove down to his home in Windsor located just across the border in Canada. A long and tiring day indeed! Next Article What ails our higher education?